A rinse-off conditioning composition comprising: (a) near-terminal branched alcohol according to Formula I; (b) a cationic surfactant; (c) a terminal aminosilicone; wherein the near-terminal branched alcohol and the cationic surfactant are comprised in a lamellar gel matrix. A rinse-off conditioning composition comprising: (a) near-terminal branched alcohol according to Formula I; (b) a cationic surfactant; (c) a terminal aminosilicone; wherein the near- terminal branched alcohol and the cationic surfactant are comprised in a lamellar gel matrix. Human hair becomes dry and/or damaged due to the surrounding environment, styling, regular cleansing, drying, and/or coloring or otherwise chemically treating the hair. A variety of approaches have been developed to condition the hair. A common method of providing conditioning benefit is through the use of hair care compositions containing conditioning agents such as cationic surfactants and polymers, high melting point fatty compounds, low melting point oils, silicone compounds, and mixtures thereof. Silicones are often used as a conditioning active for a number of hair care compositions. There is a constant need for providing conditioning compositions that can deposit an increased amount of silicone onto hair. Moreover, there is a need to providing conditioning compositions with excellent conditioning performance, but reduced stickiness and load on the hair. Finally, there is a need to find actives aiding conditioning which can be derived from natural and/or renewable sources. The use of branched compounds in personal care compositions is known e.g. W099/18929; WO2005/009385; US 6,150,312; WO2009/090617; WO2009/053931. None of the existing art provides all of the advantages and benefits of the present invention. wherein the near-terminal branched alcohol and the cationic surfactant are comprised in a lamellar gel matrix. According to a second aspect, the present invention relates to the use of the composition according to the first aspect for depositing a terminal aminosilicone onto hair. According to a third aspect, the present invention relates to a method of conditioning hair comprising applying the composition according to the first aspect onto hair. Fig. 1 : Shows deposition of silicone onto hair, which had been treated with one of four different conditioning compositions. Y is the ppm of amodimethicone deposited per gram of hair. Sample C was treated with a control composition not per the present invention. Sample I is a terminal- aminosilicone-free control. Samples II to III were treated with different conditioning compositions both of which are pursuant to the present invention. The percentage indicated relates to the wt% of amodimethicone present in the conditioning composition. Fig. 2: Shows deposition of silicone onto hair, which had been treated with one of three different conditioning compositions. Y is the ppm of amodimethicone deposited per gram of hair. Sample C was treated with a control composition not per the present invention. Sample II is a terminal- aminosilicone free control. Sample I was treated with a conditioning composition pursuant to the present invention. The percentage indicated relates to the wt% of amodimethicone present in the composition. Fig. 3 : Shows measurements of kinetic friction of hair, which had been treated with one of two different conditioning compositions, y is grams of force measured. Sample C was treated with a control composition not per the present invention. Sample I was treated with a conditioning composition pursuant to the present invention. In all embodiments of the present invention, all percentages are by weight of the total composition, unless specifically stated otherwise. All ratios are weight ratios, unless specifically stated otherwise. All ranges are inclusive and combinable. The number of significant digits conveys neither a limitation on the indicated amounts nor on the accuracy of the measurements. The term "molecular weight" or "M.Wt." as used herein refers to the number average molecular weight unless otherwise stated. All numerical amounts are understood to be modified by the word "about" unless otherwise specifically indicated. Unless otherwise indicated, all measurements are understood to be made at 25 °C and at ambient conditions, where "ambient conditions" means conditions under about one atmosphere of pressure and at about 50% relative humidity. All such weights as they pertain to listed ingredients are based on the active level and do not include carriers or byproducts that may be included in commercially available materials, unless otherwise specified. Herein, "comprising" means that other steps and other ingredients which do not affect the end result can be added. This term encompasses the terms "consisting of" and "consisting essentially of". The compositions, methods, uses, kits, and processes of the present invention can comprise, consist of, and consist essentially of the elements and limitations of the invention described herein, as well as any of the additional or optional ingredients, components, steps, or limitations described herein. The term "substantially free from" or "substantially free of as used herein means less than about 1%, preferably less than about 0.8%, more preferably less than about 0.5%, still more preferably less than about 0.3%, most preferably about 0%, by total weight of the composition. "Hair," as used herein, means mammalian hair including scalp hair, facial hair and body hair, more preferably hair on the human head and scalp. length of the compound, preferably at the omega- 1, omega-2, and/or omega-3 positions, more preferably at the omega- 1 and/or omega-2 positions. Near- terminal branched alcohols with branching at the omega- 1 position are referred to as "iso". Near terminal-branched alcohols with branching at the omega-2 position are referred to as "anteiso". For example, an alcohol with 10 carbon atoms in its carbon backbone with a methyl branch at the omega- 1 position: the branch is within 40% of the non-functionalized end of the carbon chain (e.g., 2/10 x 100% = 20%) and is referred to as near-terminal branched. Another example of a near- terminal branched alcohol is a alcohol with 10 carbon atoms in its carbon backbone and methyl substituent at the omega-3 position, which is within 40% of the non- functionalized end of the carbon chain (e.g., 4/10 x 100% = 40%). In contrast, a alcohol with 10 carbon atoms in its carbon backbone and methyl branch at the omega-4 position - the branch is not within 40% of the non-functionalized end of the carbon chain (e.g., 5/10 x 100% = 50%) and so is not referred to as "near-terminal branched." As used herein, the term "alkyl" refers to straight chained and branched saturated hydrocarbon groups, nonlimiting examples of which include methyl, ethyl, and straight and branched propyl, butyl, pentyl, hexyl, heptyl, and octyl groups containing the indicated number of carbon atoms. The term Cn means the alkyl group has "n" carbon atoms. For example, (Ci- C? )alkyl refers to an alkyl groups having a number of carbon atoms encompassing the entire range (i.e., 1 to 7 carbon atoms), as well as all subgroups (e.g., 1-6, 2-7, 1-5, 3-6, 1, 2, 3, 4, 5, 6, and 7 carbon atoms). As used herein, the term "alkenyl" is defined identically as "alkyl" except for containing a carbon-carbon double bond, e.g., ethenyl, propenyl, and butenyl. As used herein, "linear compounds" e.g. "linear alcohols" are free of branches on the carbon backbone. 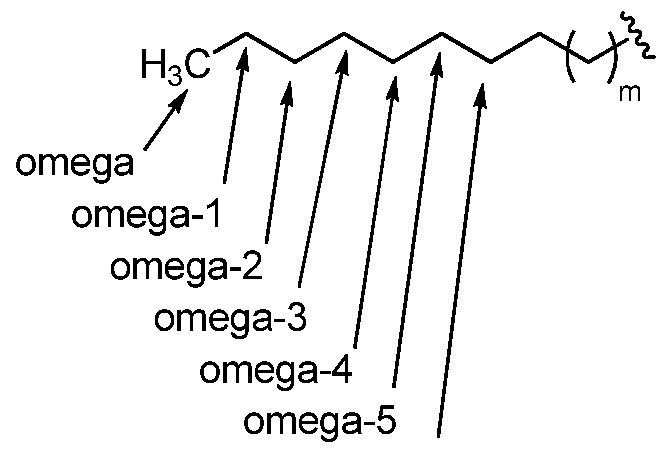 branching on the omega-5 and/or omega-6 position. A mid-chain branched compound that is 30 carbon atoms in length can have branching on the omega-12 to the omega-17 position. "Carbon backbone", as used herein, means the longest carbon chain in the compound. "Cosmetically acceptable," as used herein, means that the compositions, formulations or components described are suitable for use in contact with human keratinous tissue without undue toxicity, incompatibility, instability, allergic response, and the like. All compositions described herein which have the purpose of being directly applied to keratinous tissue are limited to those being cosmetically acceptable. "Derivatives," as used herein, includes but is not limited to, amide, ether, ester, amino, carboxyl, acetyl, and/or alcohol derivatives of a given compound. The inventors have surprisingly found that the rinse-off conditioning compositions pursuant to the present invention result in reduced kinetic friction of dry hair. Furthermore, an improved rinse profile and wet combing benefits are also exhibited by hair treated with the composition as described herein. Moreover a cleaner feel of the hair results. Furthermore, the compositions are stable at low temperatures and tolerate hard water conditions. As shown by the figures, the present invention causes increased silicone deposition. The increased deposition of terminal aminosilicone is particularly important. 18-methyl eicosanoic acid (18-MEA) is a lipid naturally present on the outside of the hair cuticle, which lubricates the hair. 18-MEA is a carboxylic acid comprising 20 carbon atoms with a methyl group at the 18 position, which is the 2-omega or anteiso position. Without being bound by theory, the inventors believe that the near-terminal branched alcohol acts as a mimic of 18-MEA and thus 'top-up' the natural lubricant of the hair. Consequently the reduced friction benefits result when hair is treated with the present invention. The inventors believe that this is due to a reduction in surface energy (reduction in inter- fiber friction). The near-terminal branched alcohol is comprised in a lamellar gel matrix. In other words, the composition comprises a lamellar gel matrix and the lamellar gel matrix comprises the near- terminal branched alcohol. The presence of a gel network or gel matrix can be can be measured by various test methods including SAXS and DSC (Differential Scanning Calorimetry) analytical test methods. The composition may comprise from about 0.05% to about 5.0%, or from about 0.075% to about 4.5%, or from about 0.1% to about 4.0%, of the near-terminal branched alcohol by total weight of the composition. 15- methylheptadecanol, 17-methyloctadecanol, 16-methyloctadecanol, 21-methyldocosanol, 20- methyldocosanol, 12-methyltetradecan-l-ol, 12-methyltridecan-l-ol and 11-methyltetradecan-l- ol, and mixtures thereof. 16- methyloctadecanol, 21-methyldocosanol, 20-methyldocosanol, 12-methyltetradecan-l-ol, 12- methyltridecan-l-ol, 11-methyltetradecan-l-ol, and mixtures thereof. In an embodiment, the composition comprises near-terminal branched alcohols selected from the group consisting of: two iso alcohols, two anteiso alcohols, and one iso alcohol and one anteiso alcohol. In an embodiment, the composition comprises a further branched alcohol, which is selected from the group consisting of: near-terminal branched alcohol; mid-chain branched alcohol; and mixtures thereof. In an embodiment, the further branched alcohol is a near-terminal branched compound. In an embodiment, the further branched alcohol comprises at least one branch located at a position selected from the group consisting of: omega-1, omega-2, omega-3, omega-4, omega-5, and omega-6; or omega-1, omega-2, and omega-3; or omega-1 and omega-2. In an embodiment, the further branched alcohol comprises only one branch, wherein the branch is located at a position selected from the group consisting of: omega-1, omega-2, and omega-3; or omega-1 and omega-2. The composition may be substantially free of any branched compound that is neither a near-terminal branched alcohol nor mid-chain branched alcohol. In an embodiment, the composition is substantially free of a mid-chain branched compound. The composition comprises a cationic surfactant. The composition may comprise from about 0.05% to about 3.0%, or from about 0.075% to about 2.0%, or from about 0.1% to about 1.0%, of cationic surfactant by total weight of the composition. The cationic surfactant is comprised in a lamellar gel matrix. In other words, the composition comprises a lamellar gel matrix and the lamellar gel matrix comprises the cationic surfactant. X is selected from the group consisting of: halogen, acetate, citrate, lactate, glycolate, phosphate, nitrate, sulfonate, sulfate, alkylsulfate, alkyl sulfonate radicals, and mixtures thereof. alkyl group. It is also believed that such cationic surfactants can provide reduced irritation, compared to those having a shorter alkyl group. The cationic surfactant may be a di-long alkyl quaternized ammonium salt selected from the group consisting of: dialkyl (14-18) dimethyl ammonium chloride, ditallow alkyl dimethyl ammonium chloride, dihydrogenated tallow alkyl dimethyl ammonium chloride, distearyl dimethyl ammonium chloride, dicetyl dimethyl ammonium chloride, and mixtures thereof. In an embodiment, the cationic surfactant is a tertiary amido amine having an alkyl group of from about 12 to about 22 carbons. The tertiary amido amine may be selected from the group consisting of stearamidopropyldimethyl-, stearamidopropyldiethyl-, stearamidoethyldiethyl-, stearamidoethyldimethyl-, palmitamidopropyldimethyl-, palmitamidopropyldiethyl-, palmitamidoethyldiethy 1- , palmitamidoethyldimethyl- , behenamidopropyldimethyl- , behenamidopropyldiethyl- , behenamidoethyldiethyl- , behenamidoethyldimethyl- , arachidamidopropyldimethyl-, arachidamidopropyldiethyl-, arachidamidoethyldiethyl-, and arachidamidoethyldimethyl-amine, diethylaminoethylstearamide, and mixtures thereof. 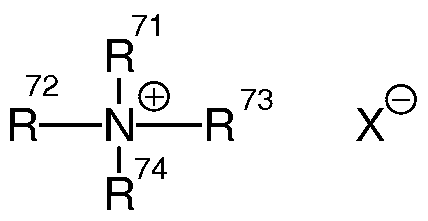 A tertiary amido amine may be used in combination with an acid. The acid is typically used as a salt-forming anion.In an embodiment, the acid is selected from the group consisting of: lactic acid, malic acid, hydrochloric acid, 1-glumatic acid, acetic acid, citric acid, and mixtures thereof. In an embodiment, the cationic surfactant is selected from the group consisting of: cetyltrimonium chloride (CTAC), stearyltrimonium chloride (STAC), behentrimonium methosulfate, stearoylamidopropyldimethyl amine (SAPDMA), distearyldimethylammonium chloride, and mixtures thereof. 1,999; Ri is a monovalent radical conforming to the general formula CqH2qL, wherein q is an integer having a value from 2 to 8 and L is selected from the following groups: -N(R2)CH2-CH2-N(R2)2; -N(R2)2; -N(R2)3A~ ; -N(R2)CH2-CH2-NR2H2A~ ; wherein R2 is hydrogen, phenyl, benzyl, or a saturated hydrocarbon radical, preferably an alkyl radical from about Ci to about C2o; A is a halide ion. 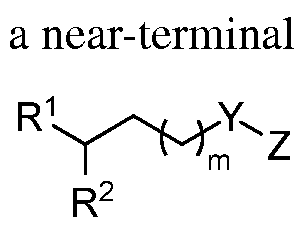 A suitable terminal aminosilicone corresponding to Formula III has a=l, q=3, G=methyl, n is from about 1000 to about 2500, alternatively from about 1500 to about 1700; and L is - N(CH3)2. 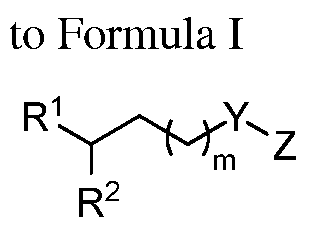 A suitable terminal aminosilicone corresponding to Formula III has a=0, G=methyl, n is from about 100 to about 1500, or from about 200 to about, L is is selected from the following groups: -N(R2)CH2-CH2-N(R2)2; -N(R2)2; -N(R2)3A~ ; -N(R2)CH2-CH2-NR2H2A~ ; wherein R2 is hydrogen, phenyl, benzyl, or a saturated hydrocarbon radical, preferably an alkyl radical from about Ci to about C2o; A is a halide ion, alternatively L is -NH2. In an embodiment, the terminal aminosilicone is selected from the group consisting of bis-aminomethyl dimethicone, bis- aminoethyl dimethicone, bis-aminopropyl dimethicone, bis-aminobutyl dimethicone, and mixtures thereof. In an embodiment, the viscosity of the terminal aminosilicone is from about 1,000 to about about 30,000 cPs, or from about 5,000 to about 20,000 cPs measured at 25 °C. The composition may comprise from about 0.1% to about 20%, or from about 0.5% to about 10%, or from about 1% to about 6% terminal aminosilicone, by total weight of the composition. In an embodiment, the weight ratio of total near-terminal branched alcohol to terminal aminosilicone is from about 0.5:1 to about 6:1, or from about 1:1 to about 4:1. In an embodiment, the lamellar gel matrix does not comprise the terminal aminosilicone. In embodiment, lamellar gel matrix comprises the cationic surfactant, the near-terminal branched alcohol and a high melting point fatty compound. In view of providing the above lamellar gel matrix, the cationic surfactant and the high melting point fatty compound are contained at a level such that the weight ratio of the cationic surfactant to the high melting point fatty compound is in the range of, or from about 1: 1 to about 1: 10, or from about 1:1 to about 1:6.
about 16%, or from about 1.5% to about 8% of a high melting point fatty compound, by total weight of the composition, in view of providing improved conditioning benefits such as slippery feel during the application to wet hair, softness and moisturized feel on dry hair. In an embodiment, fatty alcohol is selected from the group consisting of: cetyl alcohol, stearyl alcohol, behenyl alcohol, and mixtures thereof. In an embodiment, the composition comprises a linear fatty alcohol, wherein the linear fatty alcohol is also comprised in the lamellar gel matrix. The lamellar gel matrix is suitable for providing various conditioning benefits such as slippery feel during the application to wet hair and softness and moisturized feel on dry hair. The linear fatty alcohol may comprise from 8 to 24 carbon atoms. In an embodiment, the linear fatty alcohol is selected from the group consisting of: cetyl alcohol, stearyl alcohol, and mixtures thereof. In an embodiment, the weight ratio of total linear fatty alcohol to terminal aminosilicone is from about 0.5:1 to about 10:1, or from about 1: 1 to about 5: 1, or from about 2.4:1 to about 2.7:1. The composition may be in the form of a pourable liquid (pourable when under ambient conditions). In an embodiment the composition comprises a cosmetically acceptable aqueous carrier and is in the form of a pourable liquid. The composition may comprise a cosmetically acceptable aqueous carrier present at a level of from about 20% to about 95%, or from about 60% to about 85%. The cosmetically acceptable aqueous carrier may be selected from the group consisting of water and water solutions of lower alkyl alcohols and polyhydric alcohols. The lower alkyl alcohols may be monohydric alcohols having 1 to 6 carbons. In an embodiment, the lower alkyl alcohols are ethanol and isopropanol. The polyhydric alcohols may be propylene glycol, hexylene glycol, glycerin, and propane diol. about 5% pigment materials. The composition may comprise from about 0% to about 5% antimicrobial agents. The composition may have a pH of from about 6 to about 10, or from about 7 to about 10, or from about 7 to about 9. In an embodiment, the composition is for depositing a terminal aminosilicone onto hair, or for providing improved deposition of the terminal aminosilicone onto hair. The second aspect relates to the use of the composition according to the first aspect for depositing a terminal aminosilicone onto hair, or providing improved deposition of a terminal aminosilicone onto hair. The terminal aminosilicone is described herein. The third aspect relates to a method of conditioning hair comprising applying the composition according to the first aspect onto hair. 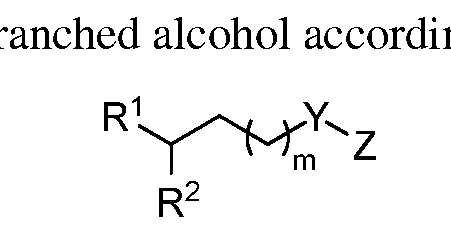 The branched alcohols may be synthesized by metathesis. Useful mechanisms are also discussed in Suguro and Mori (1979), Agric. Biol. Chem., 43 (4), 869; Yuasa and Tsuruta (2004), Flavour Fragr. J., 19, 199. Furthermore, production via genetically engineered bacteria is described in US2010/0105955; US2010/0105963; WO2007/136752; WO2008/119082; WO2009/111672; and US61/289039. Reactants and subsequent products thereof can be derived from the oils: trioleate (shown in Scheme 1), soybean (hydrogenated), rapeseed, canola, palm, palm kernel, coconut, jatropha, high erucic rapeseed, cottonseed, tallow, yellow grease, corn, sunflower, babasu, and mixtures thereof. The olefin used in the metathesis reaction can be a single branched olefin, a mixture of branched olefins or a mixture of branched olefins with other nonreactive impurities such as aromatic alkyls, paraffins, branched paraffins and cycloalkanes. hydroxide or sodium methoxide in methanol. 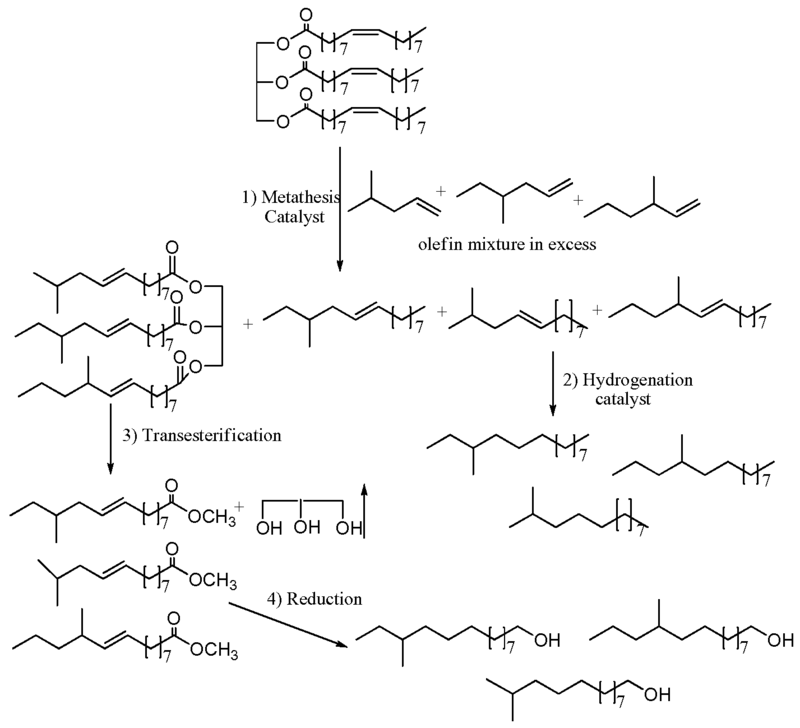 The mixture phase separates into glycerine (bottom phase) and a mixture of methyl esters (top phase) consisting mainly of 12-methyl-9-tetradecenoic acid methyl ester, 12-methyl-9-tridecenoic acid methyl ester and l l-methyl-9-tetradecenoic acid methyl ester. The unique branched methyl ester mixture is reduced using standard procedures with copper chromite catalyst in the presence of hydrogen to give essentially a mixture of 12- methyltetradecan-l-ol, 12-methyltridecan-l-ol and 11-methyltetradecan-l-ol. The mixture is vacuum distilled to provide a purified mixture. neutralized with one equivalent of an acid selected from citric, HCl or sulfuric acid. The neutralized product can be filtered to remove any solid residue. KEY: * = Derivable from metathesis of erucic acid-based triglyceride and 3-methyl-l-pentene; = a terminal aminosilicone; QSP = sufficient quantity for 100%; 1 = Dicetyldimonium chloride (-68% active) in propylene glycol and water; 2 = blend of methylchloroisothiazolinone and methylisothiazolinone; numbers without units are in wt%. KEY: as for examples table above. Data resultant from experiment 1 are found in Figure 1. Conclusions: deposition of amodimethicone of Conditioner 1 (II) comprising 4,8, 12-trimethyl-l-tridecanol and 0.5% amodimethicone is about twice as much as the control, which comprises 0.5% amodimethicone. Deposition of amodimethicone from Conditioner 1 (III) with 1% amodimethicone is very high relatively speaking. Clean, wet hair switches are treated with conditioner 2 samples at O.lg per gram of hair. Hair switches are rinsed with warm water and analysed for silicone deposition. Data resultant from Experiment 2 are found in Figure 2. Conclusions: deposition of amodimethicone of Conditioner 2 (II) with 4,8,12-trimethyl-l-tridecanol and 0.5% amodimethicone significantly greater than the control containing 50% more (0.75%) amodimethicone. Relative to the low level of amodimethicone (0.5%) Conditioner 2 (II) is displays high/efficient amodimethicone deposition. Clean and wet hair switches are treated with conditioner as per the below table. The conditioner sample is then rinsed from the hair and dried. Kinetic friction is then measured with an Instron device. The kinetic friction measurement system measures the dynamic tension while the sled moves across the hair switch surface, which calculates the average of tension after 15mm extension of sled movement. The switches are placed on a flat, horizontal surface and a 200 g sled (with black pad form) is pulled over the switch while measuring the force required to move it at a constant speed. Each experiment is performed in triplicate. Lower force implies better conditioning. Data resultant from experiment 3 are found in Figure 3. Conclusions: sample I has lower friction versus the control. The same samples as described in Experiment 3 and the Conditioner 3 table were also used for silicone deposition measurements. Data resultant from this are found in Figure 4. 2. The composition according to claim 1 , wherein the composition further comprises a linear fatty alcohol, wherein the linear fatty alcohol is also comprised in the lamellar gel matrix. 3. The composition according to any preceding claim, wherein the lamellar gel matrix comprises a high melting point fatty compound and a cosmetically acceptable aqueous carrier. The composition according to any preceding claim, wherein the lamellar gel matrix does not comprise the terminal aminosilicone. 6. The composition according to any preceding claim, wherein m comprises a carbon chain of 7 to 19, preferably is 9 to 19, more preferably 11 to 18, most preferably 12 to 17 carbons; and Y is null. 7. The composition according to any preceding claim, wherein the carbon chain of m comprises 1 to 3 branches wherein each branch is selected from the group consisting of methyl, ethyl and propyl. wherein G is hydrogen, phenyl, hydroxy, or Ci-C8 alkyl, preferably methyl; a is an integer having a value from 1 to 3, preferably 1 ; b is 0, 1 or 2, preferably 1; n is a number from 0 to 1,999; Ri is a monovalent radical conforming to the general formula CqH2qL, wherein q is an integer having a value from 2 to 8 and L is selected from the following groups: -N(R2)CH2-CH2-N(R2)2; -N(R2)2; -N(R2)3A~ ; -N(R2)CH2-CH2-NR2H2A~ ; wherein R2 is hydrogen, phenyl, benzyl, or a saturated hydrocarbon radical, preferably an alkyl radical from about Ci to about C2o; A is a halide ion. 10. 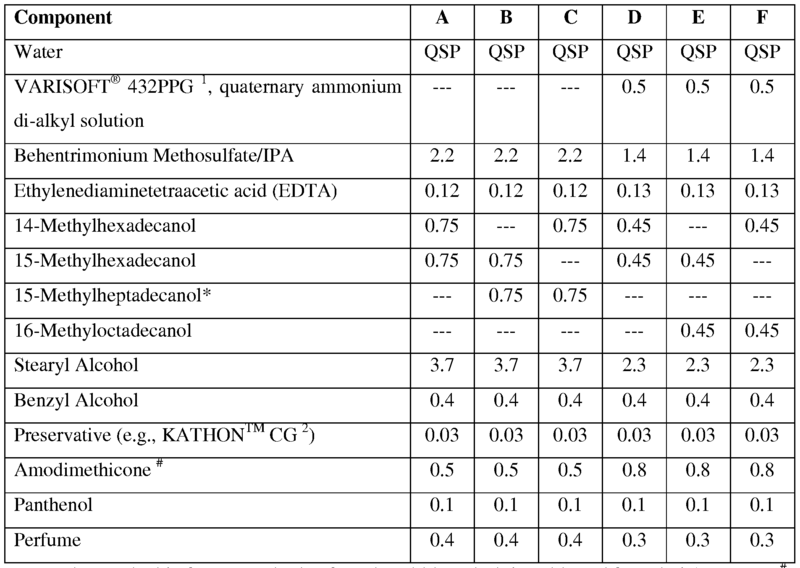 The composition according to any preceding claim, wherein the near-terminal branched alcohol is selected from the group consisting of: 4,8,12-trimethyl-l-tridecanol, 3-ethyl- 7,11 -dimethyl- 1-dodecanol, 11-methyldodecanol, 10-methyldodecanol, 15- methylhexadecanol, 14-methylhexadecanol, and 16-methylheptadecanol, 15- methylheptadecanol, 17-methyloctadecanol, 16-methyloctadecanol, 21-methyldocosanol, 20-methyldocosanol, 12-methyltetradecan-l-ol, 12-methyltridecan-l-ol, 11- methyltetradecan-l-ol, and mixtures thereof. 11. The composition according to any preceding claim, for depositing of the terminal aminosilicone onto hair. 12. The composition according to any of the preceding claims, wherein the cationic surfactant is selected from the group consisting of: cetyltrimonium chloride (CTAC), stearyltrimonium chloride (STAC), behentrimonium methosulfate, stearoylamidopropyldimethyl amine (SAPDMA), distearyldimethylammonium chloride, and mixtures thereof. 13. The composition according to any preceding claim, wherein the composition comprises from about 0.1% to about 20%, preferably from about 0.5% to about 10%, more preferably from about 1% to about 6% terminal aminosilicone, by total weight of the composition. 14. Use of the composition according to any preceding claim for depositing a terminal aminosilicone onto hair. 15. Method of conditioning hair comprising applying the composition according to any of claims 1 to 13 onto hair. MX2013000530A MX2013000530A (en) 2010-07-15 2011-07-14 Rinse-off conditioning composition comprising a near-terminal branched alcohol. CH668266A5 (en) * 1986-01-15 1988-12-15 Sandoz Ag Surfactant mixtures.